Do you remember a few weeks ago when I was lucky enough to go work with the incomparable Matthew Mead on a the Nie Nie photoshoot for his upcoming Holiday with Matthew Mead Summer magazine - Summer with Matthew Mead ? Wellllllll, the magazine is just about ready (it will be delivered mid-May) ...and I have a sneaky peek for you today! 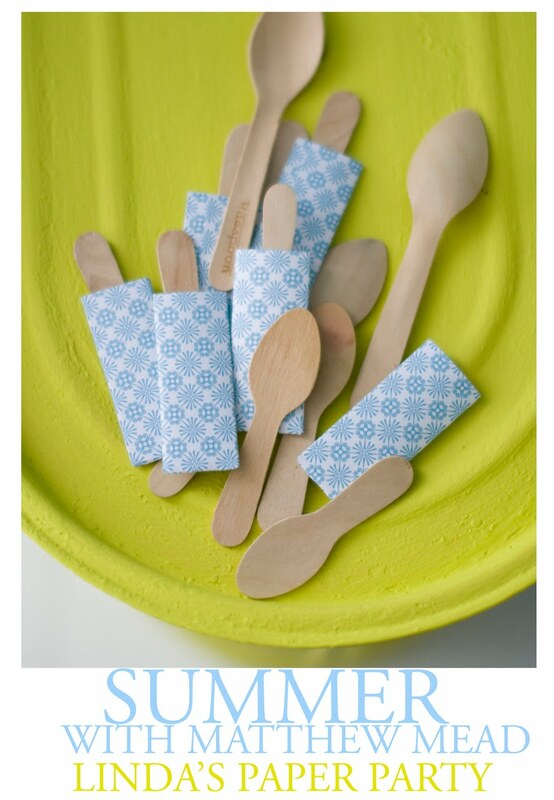 Cute icecream spoons...did someone say "icecream"? This is the article I got to work on!! 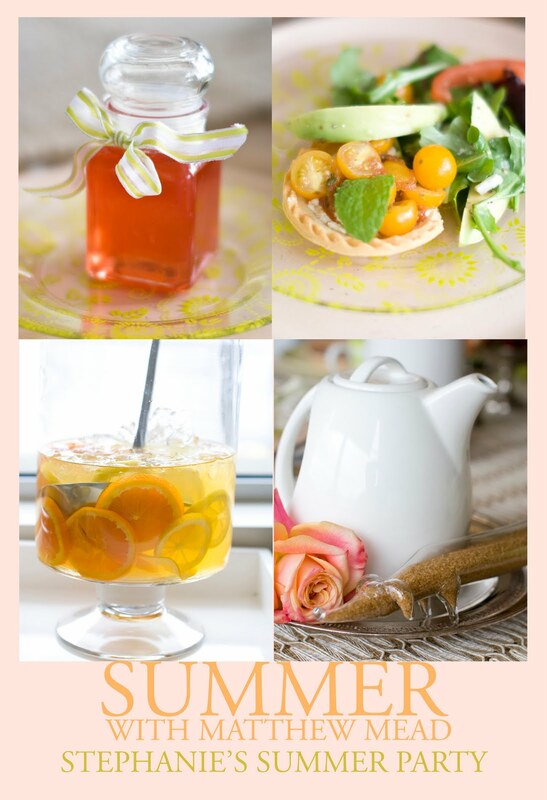 Pretty, pretty summer-y images...oh how I can't wait for warm weather and days on the porch! I don't know about you, but these images make me so excited to see the finished product!! The magazine can only be purchased online...go here to order yours!! But do I have good news for you! 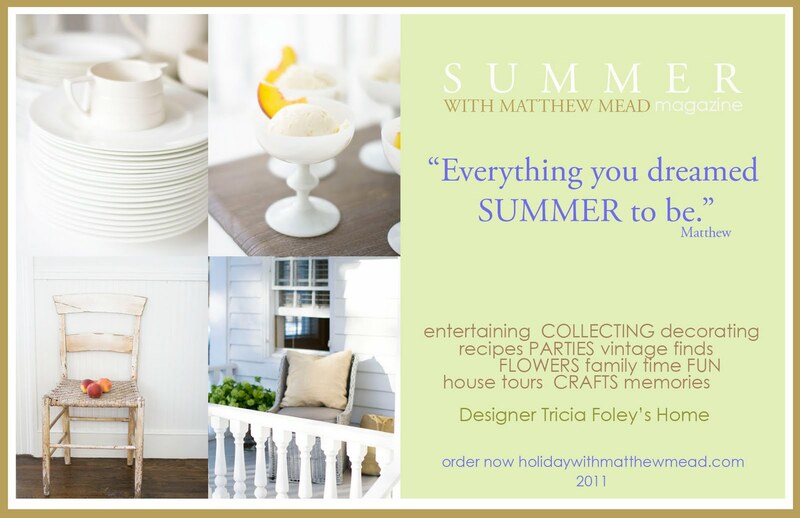 Today, one reader of the Shabby Nest has a chance to win a FREE copy of Summer with Matthew Mead!! Simple as pie to enter. Just leave me comment on this post. If you tweet, Facebook, or blog about this giveaway, you can get additional entries for each, but you must leave me a comment for each entry in order for them to be valid. This post was sponsored by Matthew Mead. The opinions expressed are 100% mine. Please enter me for a chance! I have no room in my budget right now for spending on anything but the neccessities, but oh, how I could use an escape led by the wonderful Mr. Mead and Co.
Count me in! I can't wait for summer and this book-a-zine (?) looks fabulous! oh, this magazine looks FAB!! Loved the christmas edition and sure I'll love this too! The photography is absolutely beautiful. tacky reader alert...haven't left a comment recently yet has the nerve to drop by & leave one for a giveaway. ofcourse. First time posting, love your blog! I'd love to win and read about Nie Nie's party. Read about her tragedy and was heartbroken for her and her family. But I am glad to see her healing! Lovely pictures! Please count me in. I would be so excited to win! Would love to check out a copy for myself. Thanks for the giveaway! Count me in! I'll be happy to share this on Facebook too! Love Matthew Meade. Would love to win a copy of the upcoming mag. What a dream - to work on an article in the magazine! I'd love a chance to win. Thanks. I'm sure this is a crime against crafting, but I don't yet know of Matthew Mead. I have a new reason to Google and to shop Amazon's used books. This looks like a wonderful publication to lose oneself in. Thanks for the introduction to this marvelous source of inspiration! Definitely want to see more! Thanks for a chance to win. So much lovely inspiration! Such beautiful photographs! Thanks for doing the giveaway!! I want to win!!! Pick me, pick me! Count me in please!!! I would love to win this. I wanna win!! I really REALLY do! P.s., Wendy, how's the hubby doing? On the mend? WOW!!! Would love a copy of Matthew's magazine. Please enter me into this giveaway. Please of please. I want this! Beautiful sneak peek! I'd love to win a copy. So excited for this to be ready! And equally as excited as you for those days on the porch. Beautiful stuff! Thanks for giving us the chance to win. So glad summer is on the way and sure could use the great ideas! i find so much inspiration from books like this and i look at them year after year. would love this one, the photos a gorgeous. This looks wonderful! I would love to be entered! Looks like lots of creative and inspirationsl things to see. I would love to enter! Love a chance to win. Please enter me. I can't wait to read this magazine. I can tell from the pictures you showed that it's going to be amazing! Thanks for the chance! Raising her hand to be included!!!!! OH I hope I win!!! oh how I'd love to win this! I need a little bit of summer here in our cottage in the tundra! This makes me want summer to come fast! I would love to fill my summer days up with ideas from this magazine. I'm in - can't wait to see it!! well, congrats! the sneak peeks are wonderful! i would love to win a copy! thanks for the chance! I would LOVE to win this magazine! I have been of huge fan of Matthew Mead and YOU for a long time! I would love to win this magazine! Thank you for the giveaway! Looks like a winner of an edition. Thanks for your generosity. oh how I loved the Christmas mag!! So excited about a summer one!! I cant wait! I love him. Still waiting to see the sun here in CT so I'd love a copy to at least live vicariously through the photos! :) This magazine looks spectacular! How fun! Lucky duck! In the photo with the white teapot, is that a cork doxie encased in glass? I LOVE IT!